Living at a Volunteer Fire Department is a unique experience that will be rewarding and educational! Motivation, dedication and professionalism are qualities that successful "Live-In's" must possess. Live In's of Monroeville Vol. Fire Co. #1 not only possess these qualities, but are continuously seeking to further their knowledge and skills as well. 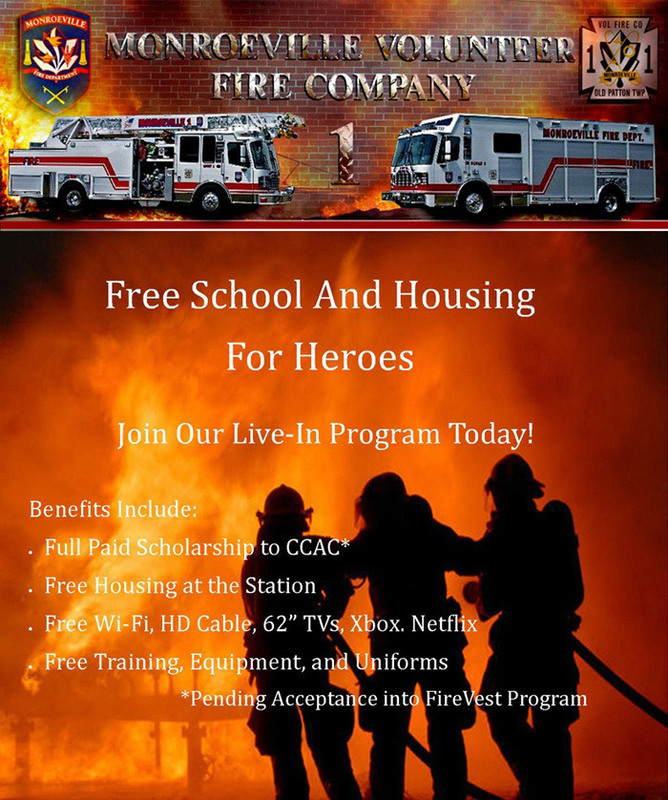 Many Live-Ins move on to full time Fire Fighter or EMS careers. Living at the Fire Station is RENT FREE, however live-ins hold the responsibility of running calls while they are at the station. The station is 12 miles from downtown Pittsburgh and in close proximity to public transportation making it a very convenient living location for students attending local colleges such as: Community College of Allegheny County, University of Pittsburgh, Duquesne University, Point Park University, Chatham University, Carlow University, Carnegie Mellon University as well as the numerous other educational institutions in the greater Pittsburgh area. Complete and NEWLY renovated station - new bunk rooms, personal storage lockers, and furniture. Past and present live-in members have gone on to jobs in some of the nation's busiest and most respected departments. By its very nature, the Live-In's respond to the majority of calls. As such, the reputation of the Department often relies on the actions of the Live-In Crew. If you have any questions please contact Vice President TJ Hartin at (412)951-1294 or tjhartin@mvfc1.com. Applications for membership can be found here.